Server City is home to the fastest, speediest bots in all of Cutebot World. The City is a constant flow of motion, and is constantly on, unlike some of the other lands that actually slow down or enter sleep mode. Because of how quickly things in Server City move, the slightest slow-down or blockage of any movement can cause mass chaos. The bots of Server City entertain themselves by having big races around the City and modifying themselves to be faster and faster. Terminal Tower is the main hub of Cutebot World. It is the place where most of the rules of Cutebot World are made, and where some of the oldest and also most basic bots reside. Terminal Bot, the unofficial mayor of Cutebot World resides here, as does the Security Force and the Codebrat-who have the ability to make code come to life. It is also here where bots can come to air their grievances and where they can get help if needed. Zodiac Land is a land perpetually under the stars, and is run by the 12 bots of the Zodiac. However, because these bots cannot see eye to eye on anything, any attempt to run the land together met in massive problems and infighting. So to prevent continuous fighting, Terminal Bot came up with an idea that every year, whoever’s sign was of that year would be ruler of the land and could decorate and make all the rules for the land as they decided for that year. Though this idea still has its shortcomings, the bots of Zodiac Land get along a lot better than they used to. Builder Pod is where the builders of Cutebot World live. Because their role is important to the continued growth and productivity of the bots of Cutebot World, they do not live in any land, choosing instead a pod that can be maneuvered through the Deep Sea to get to where they need to go. They can also keep all their plans and equipment safe here. 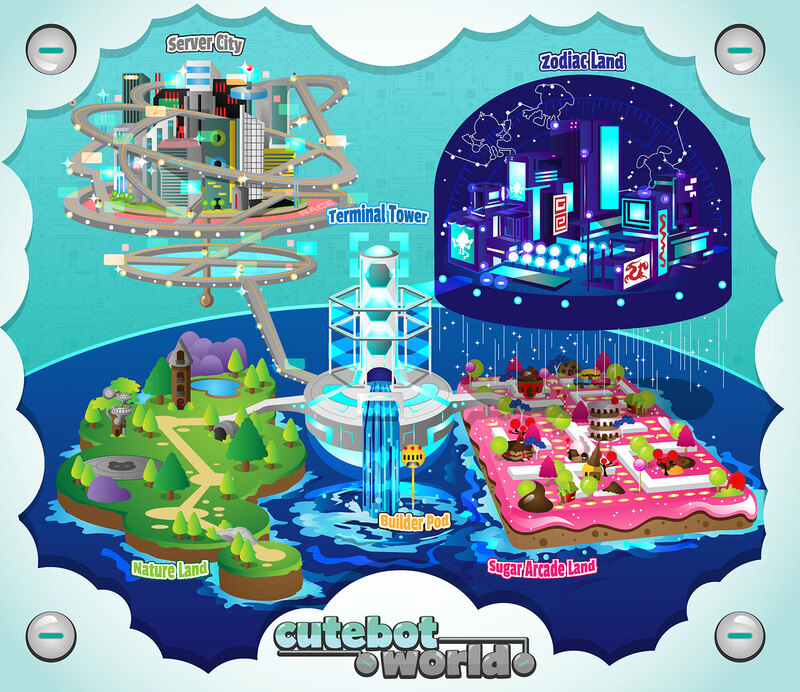 Nature Land is the most relaxing and tranquil of all the lands in Cutebot World. The bots of this land are also the smallest, and because they had issues with other bots almost trampling on them, they now sport mech suits to be comparable to size and to help keep their land beautiful and clean. Because Nature Land is so calm, it’s often a vacation spot for other bots, and also where most Buggos end up popping up, so the bots of Nature Land are often found exploring and fighting to keep their land pristine. The Deep Sea is what helps power most of Cutebot World. An ocean of electrical current, it is filled with fishbots that survive on electric particles. Because the Deep Sea is so vast, and the electrical current so strong and powerful, most bots cannot live there. However, it is watched over and maintained by the only bot that can survive for long times in its currents: Scoobadoo. She studies and manages the Deep Sea and it is her job to keep the bots of Terminal Tower up to date on any issues, like electrical surges or electrical storms.